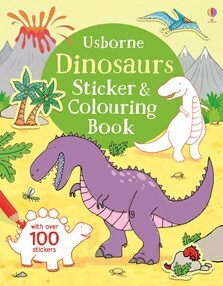 Little children can have hours of prehistoric fun adding over 100 stickers of stegosaurus, tyrannosaurus rex, pterodactyls and more to the dinosaur scenes, or colouring pictures of baby dinosaurs hatching from their eggs and prehistoric sea creatures in the ocean. Backgrounds are already coloured in so children can focus on the fun details. Perfect for young dino fans.